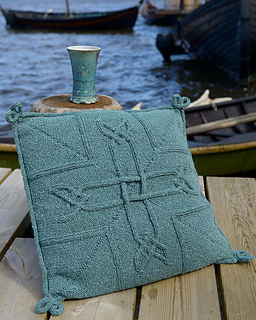 Cabled cushion in two sizes. Knit in Silky Wool to produce the smaller size and in XL for the larger. 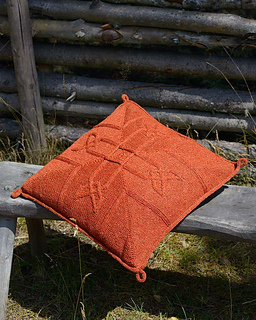 The cushion is knit in the round from the outside to the center with mitered decreases. Both sizes have icord edging. Only the cushion top is knit. A piece of fabric the same size as the top plus seam allowance is required as is an appropriately sized pillow form. Yardage reflects full skeins of the recommended yarns: 3 skeins of Silky Wool or 4 skeins of XL. Actual usage will vary. Silky Wool XL is Aran weight. The gauge for the larger cushion is 18 stitches and 26 rows in stockinette on the larger needles.